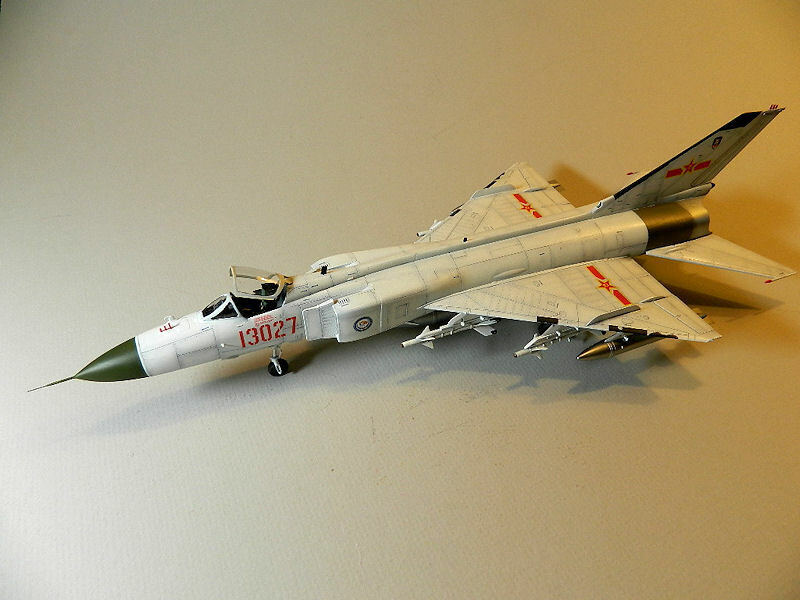 The development of a Chinese all-weather interceptor began in 1964 and resulted in the first Chinese-designed and built jet fighter. 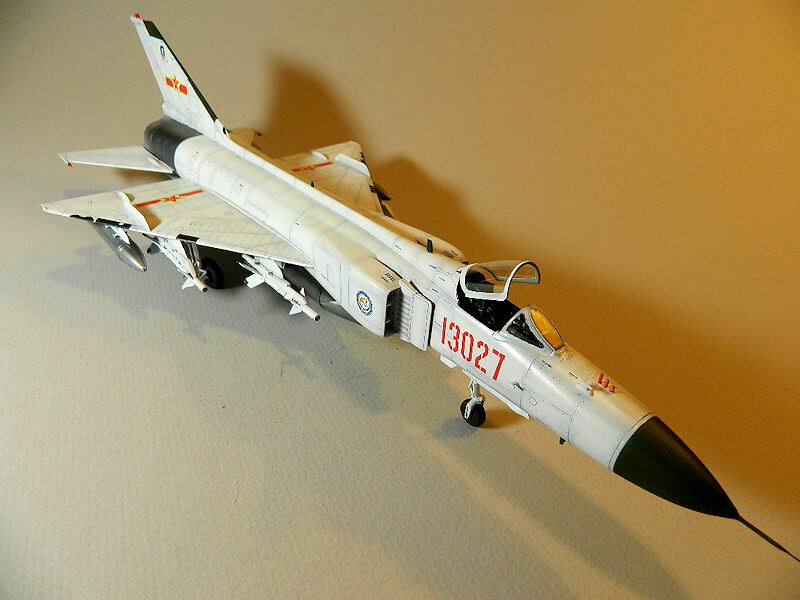 The prototype took its maiden flight in 1969, but the J-8 was not produced until 1979 and entered service in 1980. 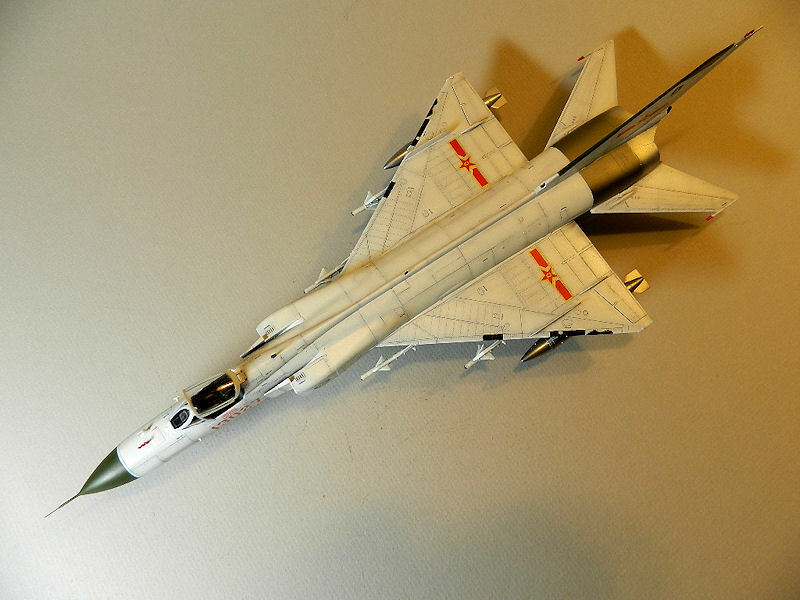 Its basic configuration resembles an enlargement of the delta-wing of the J-7, with two turbojet engines and a maximum speed of Mach 2.2. The production J-8B is equipped with Type 208A mono-pulse fire-control radar. Although this was an improvement over the original J-8I radar, the Type 208A did not have true beyond-visual-range capabilities, nor look-down/shoot-up ground attack capabilities. Therefore, it could not comply with the PLAAF's requirements. The J-8B was the early production of the new J-8II series, receiving a new radar, new engine, and a redesigned nose, cockpit and intakes. The J-8B also benefitted from a new HUD, integrated inertial navigation system/Global positioning satellite system, and TACAN technology. The J-8B first flew in November 1989 and differed from the earlier J-8. Later J-8Bs were equipped with pulse-Doppler fire-control radar and radar warning receiver, theoretically giving the later batch BVR capabilities. The aircraft is powered by two WP-13 All turbojet engines, is armed with a twin barrel 23 mm cannon, and can carry four PL-5 or PL-8 AAMs, bombs or air-to-ground rockets. The kit arrives in a very sturdy cardboard box. The kit parts are molded in a light grey plastic, featuring fine, recessed panel lines and rivets. The molding is crisp, but the surface of the plastic appeared to have a slight orange peel appearance. There are ten sprues included, bagged in sealed clear bags. Several sprues have the more delicate parts wrapped in foam plastic on the sprue. The two clear sprues, along with the small PE fret, are bagged and stowed in a separate boxed compartment within the main box. The instructions are contained within a landscape-format booklet of 16 pages. The first two pages are dedicated to the sprue layouts. There are 18 steps to the model build, plus an additional 8 steps for the under wing stores. The last page is a head-on view locating the various stores on the wings' hard points. Page 3 has a list of the parts not used in the build. There is a separate color two-sided sheet showing the paint finish and markings, plus a second one-sided sheet for the under wing stores markings. The painting sheet also notes the suitable paints from Mr. Hobby, Vallejo, Model Master, Tamiya and Humbrol. A decal sheet has the markings for two separate aircraft, including aircraft and armament stencils. A small, thin PE fret is also included for the seat belt, rear view mirrors, and intake splitter plates. Cockpit. There are two ejection seat provided, but no information on which one to use. The instructions favor the seat part E14 and the subsequent steps utilize several plastic and PE detail parts. The instrument panel is separate from the cockpit tub and features raised details. A decal overlays the raised detail. Engine Assembly. The twin engines are a multipart assembly that would be enhanced by painting before assembly of the exhaust tube halves. I was struck by how small the engines appear for such a large aircraft. The finished assembly features turbine faces, but it appears the faces will not be visible once the fuselage is closed up. The exhausts were not installed until after the model was completely painted. Fuselage. The various speed brake and main landing gear wells must be inserted in place before the fuselage halves are fitted together. Two bulkheads are also to be fitted in place, with the front bulkhead closing off the view into the fuselage cavity. This bulkhead should be painted black. Nose weight is required to keep the nose gear on the ground. The fit of the two fuselage halves together results in a minimal join that needs addressing, but a rather significant gap will be found in the aft face of the cockpit. I filled that gap with Tamiya basic putty, sanded it smooth, and hand-painted the rear section. Speed Brakes. The four speed brakes located on the fuselage underside may be posed open or closed. There is ample interior detail in the well to encourage using the open position. Wings Assembly. Before the wing tops and bottoms are fixed together, a decision must be made regarding underwing stores. The innermost pylons have two pairs of openings provided and one must decide on drilling out the inboard or outboard locations. The possible weapons layout shown on the page is a big help in making this decision. The delta wings consist of top and bottom halves, with the leading edge rolling from the top to the bottom, thus eliminating a seam along the front of the wing. The joint does not fall along a panel line and will require some filler to eliminate. Fortunately, the joint falls on the bottom side of the wing. Although not shown on the instructions, the flaps and ailerons appear to be positionable up or down. Each wing is provided with static dischargers molded in place. These features are quite delicate and care will be required during the build to avoid breaking them off. Tail and Horizontal Stabilizers. Each horizontal is made from a top and bottom half, plus two smaller parts each that serve as the attachment to the fuselage. The two smaller parts must be properly aligned with the same parts on the opposite stabilizer to assure proper dihedral between the two stabilizers. The horizontal stabilizers are fitted into substantial slots in the fuselage aft section. Step 10 addresses the assembly of the vertical stabilizer. The rudder is misidentified and should be noted as part C-2 (not E-9). The ventral strake has two option positions: on the ground and in flight. Landing Gear. The main gear were really complicated to assemble. The directions require much attention to get the pieces in their proper place. The gear did have a slightly toed-in appearance once the wheels were mounted. Underwing Stores. There are three fuel tanks and several missile options to finish the Finback. Several items are not used and will help fill the spare parts box. Canopy/Windscreen. The canopy may be posed open and the windscreen section fits tight to the front of the cockpit. The canopy itself has a rather significant raised line down the center. The raised line was eliminated with progressively finer sanding sticks and, once I was satisfied with the results, the canopy was dipped in Future. Decal markings are provided for two aircraft, both with white finishes. A white finish!! I first primed the model with a flat white primer. All panel lines were pre-shaded with a thinned mix of Tamiya flat black and red brown, and the final white finish was applied using highly thinned Model Master acryl flat white. Several applications of Future floor wax were used to provide a glossy base for the decals. A thin wash of Payne's Grey oil paint was applied to all panel lines. Some of the panel lines did fill with the Future and did not take the panel line wash all that well. The kit decals went on with applications of MicroSet and MicroSol. The larger decals had a tendency to bridge over the panel lines and rivets. I used a hobby knife blade to slice the decals over the panel lines and a needle to pierce the individual rivets. I then brush-applied Solvaset to help them settle down further. I airbrushed Model Master Acryl satin as the final finish. First, allow me to thank Stephens International and IPMS/USA for the opportunity to build and review this kit. I would like to see more manufacturers follow Trumpeter's lead in the packaging of their kits with the protection of the more fragile parts. The individual bagging of sprues with the more delicate parts being protected by foam plastic and the separate compartment for other delicate parts is most appreciated. This kit went together rather quickly with no fit problems. A few joints needed filling, but nothing out of the ordinary. The end result is a pretty neat model. 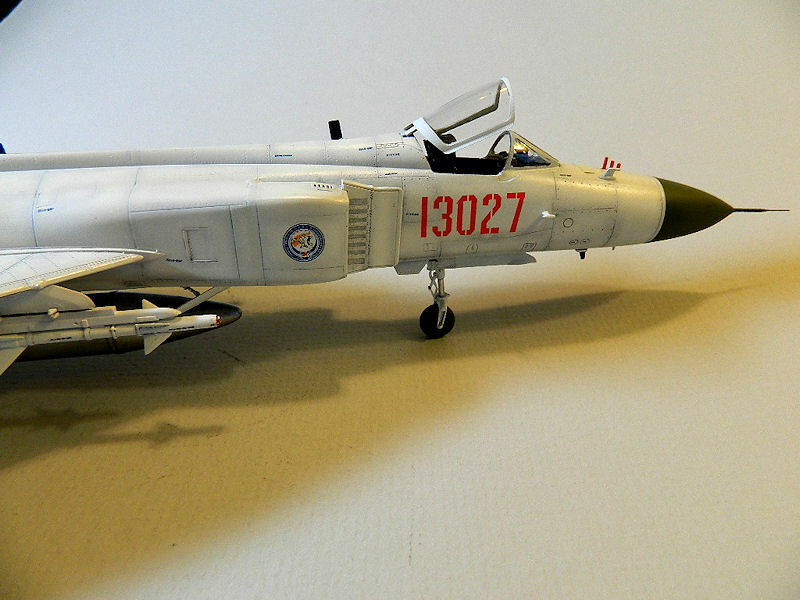 I would not hesitate to recommend this kit to any modeler with any skill level, and to the modelers interested in modern Chinese Air Force aircraft.